Cohesion policy covers every region in the EU. However, most of the funds are targeted where they are most needed: at regions with a GDP per capita under 75% of the EU average. How are regions defined? Cohesion policy uses the EU's NUTS system, which divides each country into three levels of statistical units (NUTS regions), according to population size. 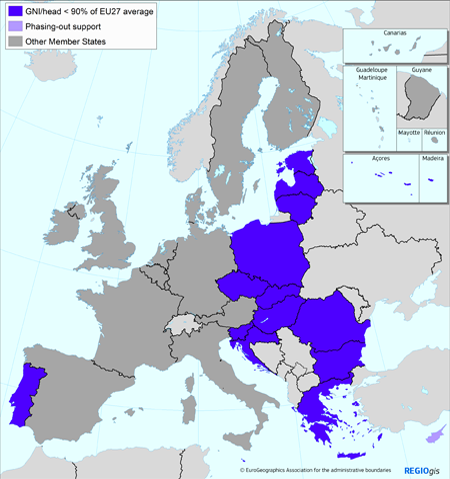 The EU is currently divided into 276 'level 2' regions, all of which are covered by cohesion policy. NUTS level 1 3 million 7 million.